There came a time in my life that I needed more information about my life and the world around me than what my eyes and ears was telling me. I had a driving force within me telling me to look deeper into the greater scheme of things and if I looked deep enough that I would find something special there just for me. So as I began to walk this red road, I became aquainted with various teachers of the Lakota ways and one Jim Gillihan, the keeper of Chief Sitting Bulls Sacred Pipe, shared with me the teachings of the sacred ways of the Canunpa (Sacred Pipe) and the Hanbleceya (Vision Quest or Crying for Vision). I had been given the proper instructions for preparing for the vision quest and had tied all my prayer ties (hundreds) and prepared all the things needed for my altar and a special pouch with tobacco to give to the one whom conducts the ceremonies a sacred offering. On the first day we set up our camp for the weekend and after that we went with one of the medicine mans helpers to pick the right "spot" for each of us to be at for our vision quest (I didn't say sit because sitting is not the only event.) Through the night we all sat around the fire and shared ideas and philosophies about just what we were supposed to be doing there doing this ancient way. But also I was told by one of my teachers Dennis Jackson that we must see ourselves Sundancing in our vision before we can sundance and Great Spirit had already called me before its great mystery at the sacred cottonwood tree, so here was a valid purpose to "request" a vision I needed to see me in a vision....Sundancing. With a true heart and a good purpose I went into the sacred Inipi Purification in a good way. These "Purificaions" are done before most sacred ceremonies to purify all participants to cleanse the mind, body, and soul, of those who attend so that they may enter the sacred ceremonies in a 'good way'. During this process we were instructed not to talk to or look at anyone until after all the ceremonies were over and the medicine man or his helper said it was okay to do so, so I didn't. That was also difficult for me, because I like looking at people in different ways and watch the many different responses, and the eyes are mirrors of the soul. Right after the Inipi I was taken by the medicine man to my spot in which to set up the sacred Hanbleceya altar and to "Cry for Vision". It was a neat place overlooking a deep cut gully filled with trees and wildlife... it was pleasant. All day I sat and prayed seeking that "vision", looking around, waiting. Sunset came so I smoked from the sacred Canunpa, stood and sang the sacred songs as I knew them for these times and needs. As night time came it was cold and still no "vision". Then the sun came up and I sat there for a while. Then I smoked on the Canunpa again and asked Great Spirit to let me see a vision meant for me, and as I spoke it came quiet and slow but clear to me, I say no more. The time for my Hanbleceya had passed and the medicine man came for me, his old, gray, skinny self, but filled with knowledge and love for the people. As I collected my things and removed any trace that I had been there the old man smiled and said to me, "It is good to see someone who walks those native ways," as he looked about the area we were now leaving back to the grandmother the caretaker of all living things upon her. I couldn't help but to notice as I returned to the Inipi to finish this ceremony all of the people were standing in the honoring way and faced me as I returned. All of them kept their eyes on the ground in order to show their respect to my spirit. I didn't see what I expected. Yes, I saw myself dancing and gazing at the sun and piercing, but I saw much more. The visions in my life are there for all who walk the good road but also there is more for us if we, with our humility, go before Great Spirit and the Grandfathers and ask them to help us open our eyes. on one continuous red string. ending with a black prayer tie. Ties must be cotton and only use tobacco for your prayers. 4.) Prayer Ties for 2 sweat lodges. 16 ties black, red, yellow, white, on one continuous red string. 5.) No more than 2 blankets and no pillows. 6.) A shell or a clay bowl for smudging. 7.) Sage, tobacco, cedar, sweetgrass. 8.) Box of wood matches. 9.) 6 cherry sticks for flag poles approx. 30"x1/2"
10.) 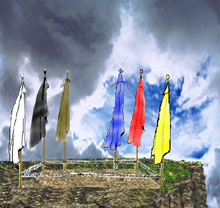 6 flags made of cotton cloth. black, red, yellow, white, brown, blue. 11.) Your sacred feathers for prayer. Only Eagle and Hawk feathers will be allowed. I am trusting any of these types of feathers possessed by you is done so legally. 12.) Drum (small traditional) if you have one. 13.) Appropriate clothing for the sweat lodge. 15.) A change of clothes for your journey home. and also on the last day we will have a meal together for the questers. 17.) Your own camping gear, no hotels here. dogs, animals of any kind unless for butchering, guns or weapons. We ask that why you are here that you remain respectful to our way of life as we would yours. Everyone who attends will be expected to work to make things happen and come together. This is not a luxury vacation each and every person will be expected to do their part. or call me at (417) 859-7812 for a map or any questions.